One last call for alcohol, so finish your whiskey or beer. 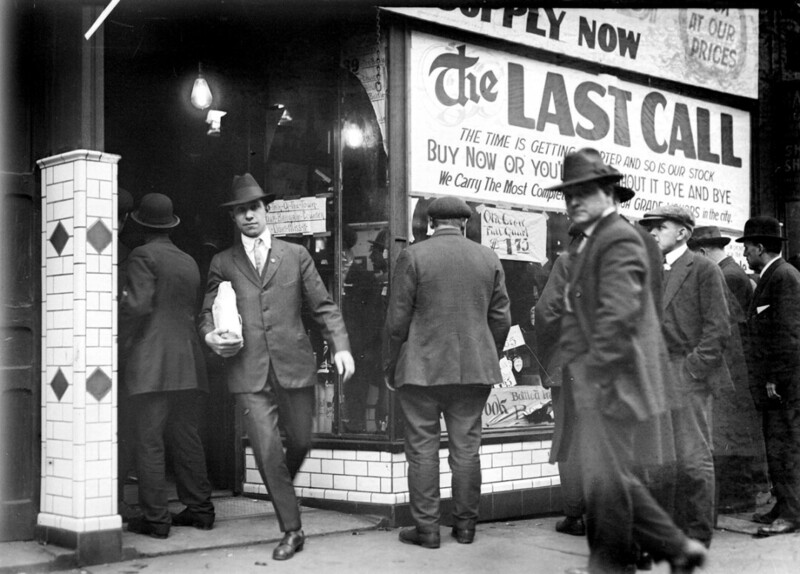 Business was brisk at a Detroit liquor store on the eve of Prohibition in 1919. You’ll soon be able to lift a glass – literally – to toast a museum exhibit telling the story of the Prohibition Era in the United States. The traveling exhibit, “Spirited: Prohibition in America,” will be on display at the Chippewa Valley Museum in Eau Claire from April 9 through May 25. On April 13, the museum will host a “Speakeasy Party” where “Wets” will thumb their nose at Prohibition by drinking “prohibited” beverages, dance to big-band music, and play casino-style games. With the benefit of hindsight, Prohibition may seem like a quaint historical oddity, but its passage, enforcement, and repeal offer lessons for contemporary society. In the early 20th century, that power was in the hands of the Temperance Movement, which gained the upper hand in the national debate over alcohol and its attendant social ills. In the Chippewa Valley, the debate over Prohibition was split somewhat along ethnic lines, with American-born “Yankees” on one side and beer-loving German immigrants on the other. Prohibition had a big impact on the local economy: When the 18th amendment to the U.S. Constitution was ratified in 1919, the Valley was home to the Jacob Leinenkugel Brewery, Eau Claire Eagle Brewing Company, Bloomer Brewery, Durand Brewing Company, and the Walter Brewing Company. Only Leinenkugel’s still exists. Considering Wisconsin’s well-deserved reputation as a center for brewing, Prohibition’s popularity in the state was mixed. On one hand, the state did vote to ratify the 18th Amendment in January 1919 (although not until enough other states had already approved it). However, Wisconsin was also quick to push for repealing Prohibition: U.S. Sen. John Blaine of Wisconsin introduced the original draft of the 21st Amendment – which repealed Prohibition – in late 1932, and the following spring Wisconsin became the second state to approve the new amendment and thus in favor of repeal. Within a year, the beer was flowing again. 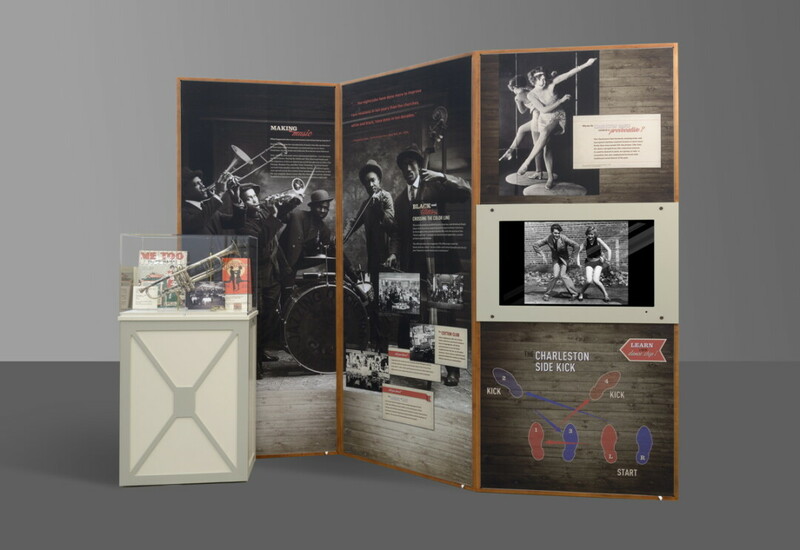 The “Spirited” exhibit was developed by the National Endowment for the Humanities, and is based on an exhibit at the National Constitution Center in Philadelphia. Ronnander said the 1,400-square-foot exhibit will be installed in the museum’s Ayres Associates Gallery, which until recently housed the “Picture of Health” exhibit. In addition to the 15 crates of material that will soon arrive, the exhibit will be supplemented by items from the museum’s own collection, such as items from Walter’s and Leinenkugel’s breweries, Ronnander said. “Through the exhibition, visitors will learn about the amendment process, the changing role of liquor in American culture, Prohibition’s impact on the Roaring ’20s, the connections between women’s suffrage and the temperance movement, and how current liquor laws vary from state to state,” the museum explained in a press release. Several special programs will highlight the exhibit. On Saturday, April 13, a “community day” will run from noon to 4pm, which will include hands-on activities and presentations for all ages. From 7-9pm that evening, the museum will host a 21-plus “Speakeasy Party.” Tickets will be $10 for museum members and $15 for non-members, but don’t worry: Unlike a real speakeasy, you won’t need a password to get into this party. The Chippewa Valley Museum has several other events planned in coordination with the exhibit, including an April 23 lecture about Prohibition in Eau Claire and a May 11 tour of the home of Waldemar Ager, an Eau Claire writer and Temperance advocate. To learn more about these and other museum events, visit cvmuseum.com.